Available from Particle & Surface Sciences , test sieves are manufactured from stainless steel woven wire mesh that is measurement traceable to NAMAS. The seamless stainless steel metal frame also ensures an accurate high quality fit. 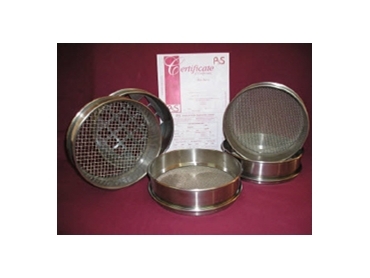 Sieves are also available in perforated plate. All test sieves from Particle & Surface Sciences have been serialised to adhere to the requirements of quality assurance systems for traceability of measurement devices. Test sieves are manufactured using image magnifying-based optical measurement system that ensures the opening sizes and wire diameters of wire cloth used is traceable to National Standards. Test sieves are fully compliant with international standards BS 410, ISO 3310/1, ASTM E11, UKAS Traceability and NAMAS 0419. Each test sieve is supplied with a Certificate of Conformity to the applicable specifications and bears the serial number of the sieve. The aim of this is to help support and augment quality systems.